"This is a lovely show off cake, especially when you want a fancy finale to a dinner party. Sprinkle with confectioners sugar over top just before serving to make it look even more attractive and delectable." Preheat oven to 350 degrees F (175 degrees C). Grease and flour one 9 inch tube pan. Separate the eggs. In a bowl, beat the egg whites until stiff. Set aside. In a large bowl, beat the butter with the sugar until thoroughly creamed. Beat in the egg yolks, then the jam, vanilla extract, and dark rum. In a small bowl, stir together the flour and baking powder. Beat the flour mixture into the creamed mixture, then stir in the nuts. Stir about 1/3 of the beaten egg whites into the batter to lighten it and then fold in the rest gently but thoroughly. Pour the batter into the prepared pan. Bake at 350 degrees F (175 degrees C) for 65 to 70 minutes or until a toothpick inserted near the center comes out clean. Transfer to a rack to cool. Makes about 12 servings. This was very good. I left the nuts whole but did everything else the same. Cooked for one hour and it was perfect. Moist and not too sweet. I think it would be good with a raspberry glaze. Excellent, even better the following day. Moist, rich flavour. Worth the effort of grinding the nuts. 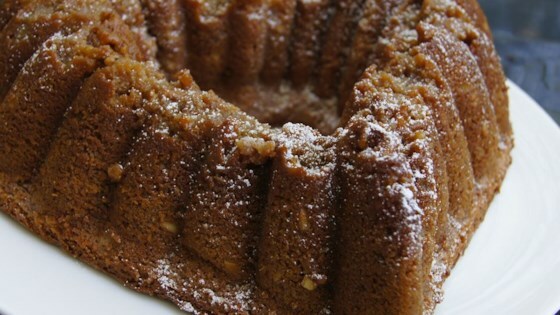 The cake tasted fine, but it completely came apart when removed from the bundt pan. It just wasn't a very strong cake.